My racing career thus far has been conducted on the Ribble that I snapped (which is now on eBay for all you budding carbon mechanics) and more lately the Raleigh Avanti frame I bought. 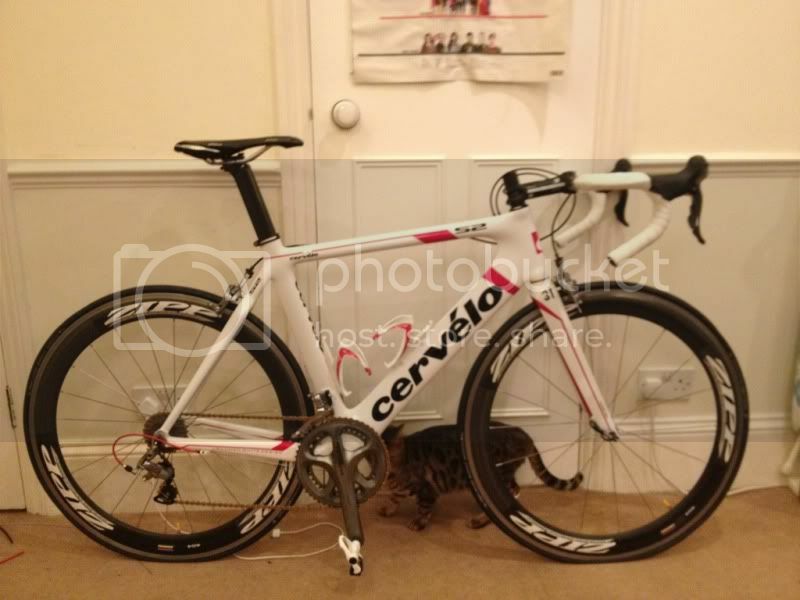 Now I was a firm backer of the “its not about the bike” ethos, I mean, I placed in most of my races on a bike worth not a lot of money, so how could the bike make much difference? Anyway, it quickly came to my attention that commuting, training, and generally doing hundreds of miles per month on the same bike that I plan to race each weekend was going to be a lot of effort. I was already spending about 2 hours every Saturday picking flint and crap out of my tyres, before washing off a kilogram of dirt and sand from Richmond Park, and frankly it was quite annoying. It meant that a race took up most of the day as I’d be out in the shed for two hours previous, and then when I got back I’d have to make sure it was up for a commute! I’m actually fairly resistant to spending large chunks of money on things usually, most of my kit is second hand, I generally have become quite a tight miser, even at such a young age! 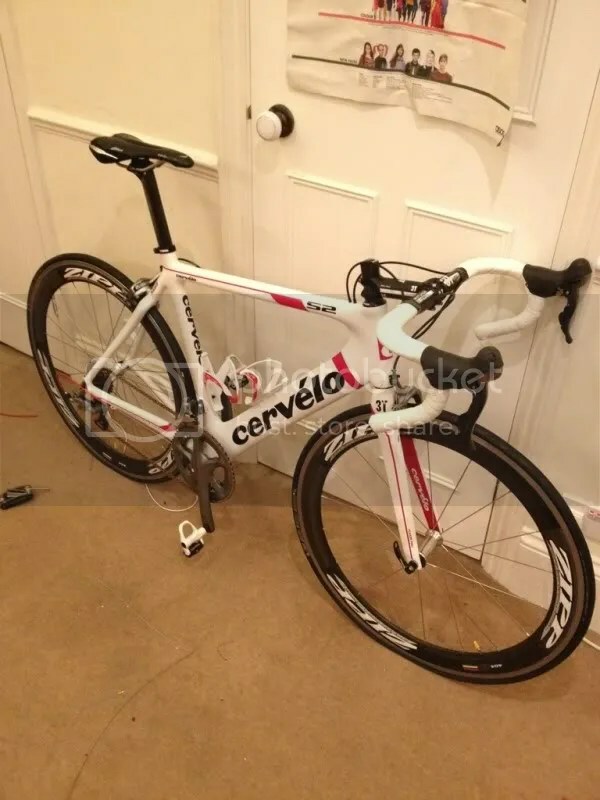 So when a clubmate got in touch about a mint condition (almost) Cervelo S2 frame, in white and red (my favorite), I was excited, then depressed knowing that the sensible side of me would say to leave my cash in the ISA. But a few conversations later, and some top notch closing from my clubmate I was sold. I also picked up the wheels too. 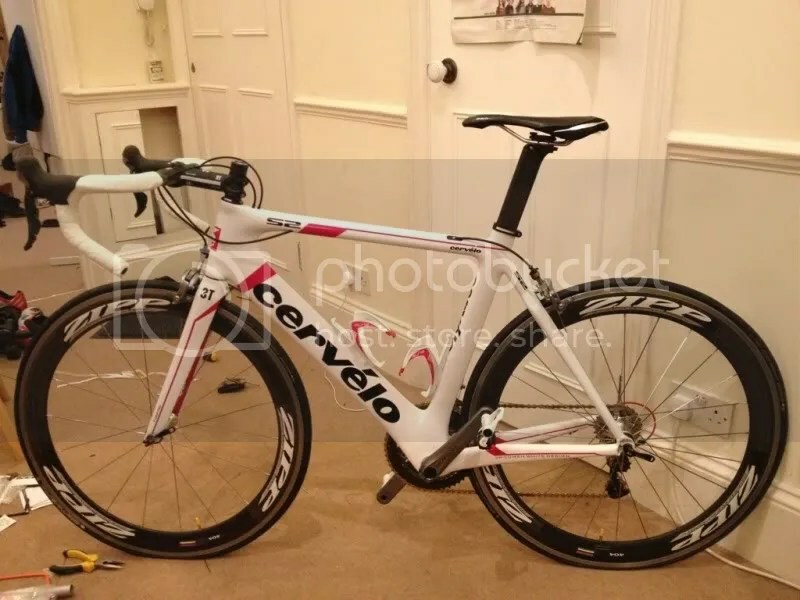 So I had gone from zero to hero in bike stakes (and vice versa in saving stakes), and I now have the S2 with 404’s sitting in my room, waiting to be built, I’m itching to ride, it but also conscious that it will never be quite that clean again! A meaty bike by anyone’s standards, I’m happy that I’ve done it, now in theory that’s my race bike sorted for the near future, and hopefully I won’t be able to blame it when I don’t place in races 😀 I also managed to save a huge chunk of money, and saved approx 50% off retail on the group, wheels, and frame, which considering it all looks brand new, is some going! Don’t buy new folks, its a mugs game (although lifetime warranty would be nice…)! I’ll attach some pictures later, but suffice to say I’m very happy with my bike, and you can find me longingly looking at it in the bedroom waiting to be ridden, and ridden hard! 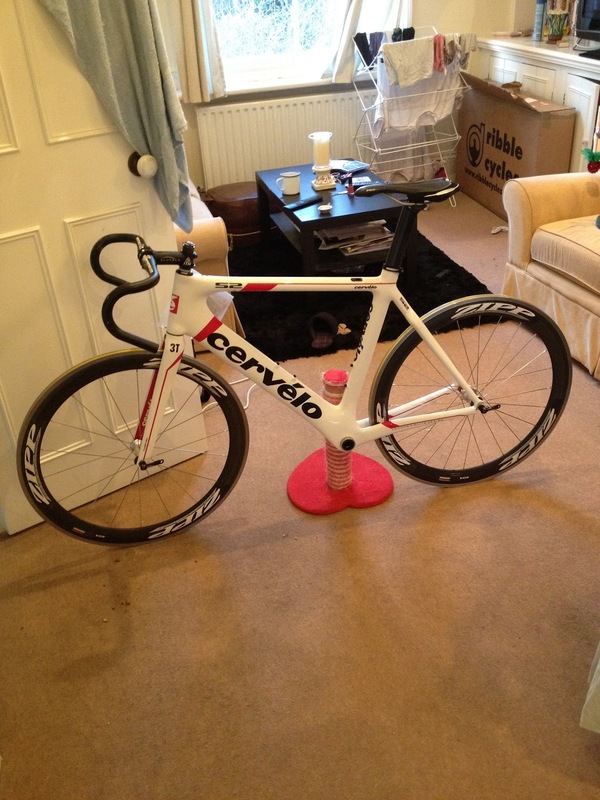 Cervelo S2, made up almost totally of second hand bits, but looks pretty fresh to my eye. Worth shopping around as I think off retail of all the new parts I saved over 50 % over all. 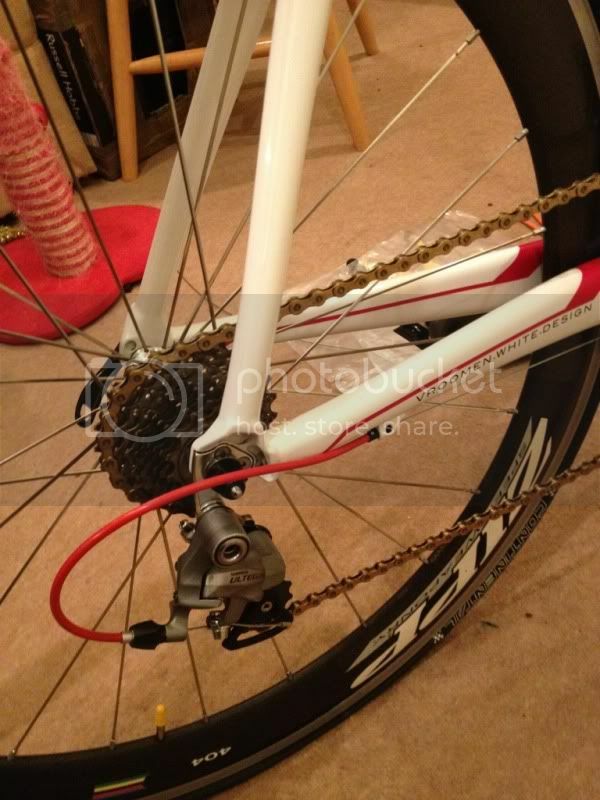 And when you consider the frame, wheels and group were over £3500 new it certainly shows what can be done! Its been 2 and a bit months since my first post on the subject. Its been a good thing to have done I think. I’ve raced 7 times, won twice, crashed once, finished in the top 10 three times and finished in the bunch once and came 10th in the series. So its been a fairly mixed bag and its certainly opened my eyes to a few things. Mostly its been a bit of an up and down, its quite annoying to go from winning to not, I would much rather it had happened the other way around, but in the main there have been good reasons for it, and usually they were positioning or timing. Which I’ve now come to appreciate are probably the most important things in Hillingdon races (and probably other similar circuits) . So lets hope what I’ve learned I can take in to the road race season, I’m hoping to race most weeks over the season, which should teach me a lot more, and empty my bank account at the same time! Hillingdon will still be something I’ll do every now and again as I can go from work, but I want to concentrate my efforts on the longer stuff. And I’m excited to see what I can do this season, not to mention ride in the warm again! I probably did about 1000 miles ALL winter last year, whereas I did just under 1k in Jan this year, so it does feel like I’ve not seen the sun or warmth for ages and ages! The last 5 months or so have been probably the months that I have started to take cycling a bit more seriously, I’ve started to drink a bit less, try not to smoke too much, and watch what I eat, so its been quite interesting to see how I’ve improved over that time. Mostly though the improvement was down to riding the bike, I’ve averaged about 200 miles a week since October, and that has been mixed up hugely, mostly commuting, but I’ve tried to plan them, also done a good few hilly rides, and plenty of fast chain gangs. So there has been no easy way out as such, and I’ve taken winter at a nice pace. Of late I seem to have re-found my passion for a bit of football, which although great, doesn’t bode well for cycling as the knocks and muscles you strain and pull that cycling doesn’t use at all certainly have an impact when you get back on the bike. So will have to strike a balance! I’ll keep updating this as I go through the year, I’m now a 3rd cat with 15 points, so 25 to go this year before I am a cat 2 rider. That is still the aim, and I hope to take some points in road races, obviously we will see how that pans out as 25 fast and frantic miles is a far cry from 60 round the roads, but I’m hopeful that I’ve put in some good work so far, and with the on-going training other members in the club are undertaking it makes it a bit easier to get out there and do some miles with like minded folk and I’ll be able to get some results on the road. First race is on the 11th of March and its our club race, so lets hope its a good one!